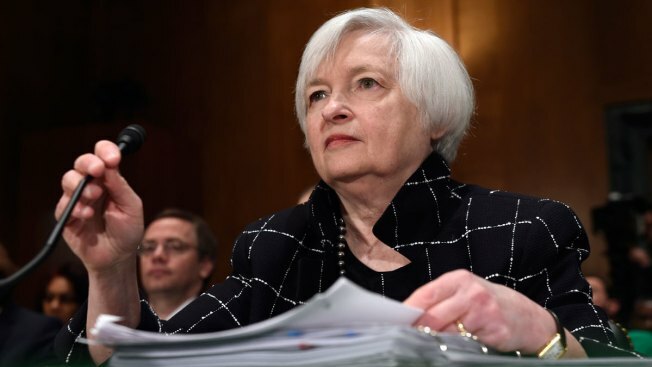 In this Thursday, Feb. 11, 2016, file photo, Federal Reserve Board Chair Janet Yellen prepares to testify on Capitol Hill in Washington, before the Senate Banking Committee hearing on: "The Semiannual Monetary Policy Report to the Congress." On Wednesday, April 27, 2016, the Federal Reserve releases its latest monetary policy statement after wrapping up a two-day meeting. The Federal Reserve is keeping a key interest rate unchanged against the backdrop of a global economic slump and providing no hint of when its next rate hike may occur. A statement the Fed issued after its latest policy meeting notes that the United States is enjoying solid job gains despite a slowdown in growth. The Fed says it also expects inflation to move toward its 2 percent target from persistently low levels. But with China, Europe and other major economies struggling and potentially threatening U.S. growth, the Fed decided to hold off on a further rate increase. The Fed raised its benchmark rate from a record low near zero in December. Some economists say it may not raise it again before the second half of this year. Concerns have been rising about the world economy, and any major international slump would, in turn, hinder U.S. growth. A sharp slowdown in China — the world's second-largest economy after the United States — has already hurt the developing world. Europe is straining to gain momentum, and Japan is hobbled by wary consumers and an aging population. Even in the United States, despite a robust job market, key sectors like manufacturing and energy have been bruised by a strong dollar and shrunken oil prices. Consumers have barely stepped up their spending this year. And on Thursday, the government is expected to estimate that the U.S. economy grew at a tepid annual rate under 1 percent in the January-March quarter. Some forecasters think growth might have been as weak as 0.3 percent, which would mean the economy nearly stalled out last quarter. What's more, U.S. inflation is running well below the Fed's optimal level of 2 percent. In the meantime, far from considering rate hikes, other major central banks are weighing steps to further ease credit, increase inflation and bolster growth. On Thursday, for example, when the Bank of Japan meets, a key topic will be what else it might do to fight economic weakness, raise inflation and blunt a rise in the yen's value against the dollar, which hurts Japan's exporters. In January, in a desperate bid to raise inflation, Japan's central bank introduced negative rates. Yet inflation and growth remain stuck near zero. Last week, Mario Draghi, head of the European Central Bank, made clear he was ready to launch more stimulus efforts if needed to energize the 19-nation eurozone economy. That pledge came after the ECB had already expanded its stimulus programs in March. China's sliding economy has stabilized after worries about its growth had rocked financial markets in January. But now, a new challenge has raised international concerns: A June 23 referendum in which Britain will decide whether to leave the European Union. President Barack Obama and other world leaders have warned that a British exit from the EU could threaten the global economy. Because that vote will occur just a week after the Fed's June 14-15 meeting, some analysts have suggested that the U.S. central bank would avoid any rate hike in June for fear it could rattle markets ahead of the British vote. Since raising rates from record lows in December, the Fed has grown concerned about economic pressures from overseas and has signaled its willingness to wait for those pressures to ease. The Fed's rate hike in December was its first in nearly a decade, and it ended a seven-year period in which the central bank had kept its benchmark rate near zero. At the December meeting, the Fed signaled that four additional rate hikes could occur in 2016 but at its March meeting, it cut that expectation from four to just two rate hikes. A solid majority of officials appear to support the cautious approach being pursued by Chair Janet Yellen. In her most recent speech on the economy, Yellen said she still envisioned only a gradual pace of rates increases in light of global threats.